Be sure to check our Facebook page for more information! 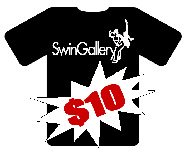 The SwinGallery is Cincinnati's longest running Lindy Hop Venue (est. Jan 4, 2001)! We strive to promote the dance community by providing social, educational and artistic opportunities in a welcoming and safe environment. We specialize in Lindy Hop Swing, East Coast Swing, Jitterbug, Charleston & Balboa! Our dances are EVERY THURSDAY at Leapin' Lizard Lounge - 726 Main St, Covington, KY! All ages are welcomed! No partner required! Casual attire is welcome! Our Beginner East Coast lesson starts at 8:30 sharp. Our dance starts at 9pm. The cover charge is $5.00 for everyone and we typically have between 50 and 100 dancers per evening! We also offer Intermediate &AMP; Advanced Lessons in Lindy Hop, Balboa & Charleston at 7:30. See the Calendar for details. There are Swing Events all over our city all the time, please see our The Regional Calendar for more info! if the calendar cannot be seen, right click in the white area and choose "refresh"
The SwinGallery was voted the Best of Cincinnati in December 2010! Thanks for helping make our venue fantastic!